Home Blog How to Operate a Compression Package in less-than-100% Capacity to Optimize Efficiency and Minimize Wear? Speed First. How to Operate a Compression Package in less-than-100% Capacity to Optimize Efficiency and Minimize Wear? Speed First. If upstream supply (i.e. suction pressure) is increased, the compressor’s capacity may need to be reduced to prevent damage to the compressor and driver from overload, or from operating outside permissible operating conditions. Reduced level of supplied gas over time may require that the compressor flow capacity be reduced in order to maintain suction pressure at a minimum acceptable level. Different methods may be used to reduce capacity. These methods are summarized in Table 1 for an exemplary 3-stage, 4-throw unit. Among these methods, varying the operating speed is the first recommended method as it is an excellent way to control capacity without requiring additional equipment on the compressor. The advantages of this method are the reduced wear and tear of the machine, and increased compressor efficiency. 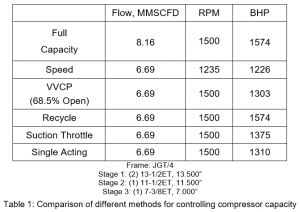 For the configuration presented in Table 1, for example, reducing capacity by speed will reduce compressor wear and tear, i.e. RPM, by 18%. In contrast, by using a VVCP, single-acting the cylinder, or throttling, unit will unnecessarily run at full speed, whereby long-term maintenance costs are increased. Likewise, a recycle loop is very inefficient as the energy used to compress the excess gas is completely wasted and the bypassed gas also has to be cooled. 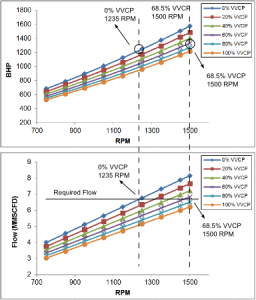 Flow versus RPM, and BHP versus RPM curves of the above 3-stage unit with the following operating conditions are shown in Fig. 1. Fig. 1: Q-RPM and BHP-RPM curves of a 3-stage compressor at operating conditions Ps=40 psig, Pd=1000 psig. Required capacity (6.69 MMSCFD) can be reached by different methods summarized in Table 1. 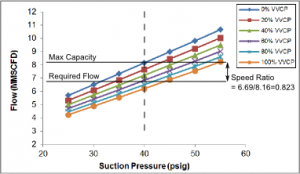 Find performance curve with appropriate discharge pressure. Find desired suction pressure and capacity point on applicable curve. Ratio the desired capacity to the maximum capacity (i.e. highest performance curve) at the specific suction pressure. Check to make sure the ratio multiplied by the engine speed is within the minimum operating speed of the equipment. If ratio multiplied by the engine speed is below the minimum operating speed, select the next lowest unloading step and repeat. Configure the compressor for the maximum capacity unloading step and reduce the speed to the calculated RPM. For instance, in the example of Fig. 2, maximum capacity at 1500 rpm is 8.16 MMSCFD. Therefore, the desired capacity ratio and speed are 0.823 and 1235 RPM, respectively. Fig. 2: Q-Ps performance curve of a three-stage compressor at 1500 RPM, Pd=1000 psig. Required capacity (6.69 MMSCFD) can be reached by operating at 1235 RPM and 0% VVCP. If you have any questions, or would like more information about Compass, please contact the Compass Sales team at 1-855-262-2487.